I want to do sn Afghan for a friend in the Colors of the university of alabama but it's hard to know the exact Colorado of red/ crimson. Any Alabama crocheters out there who can help? I use either red heart or hobby lobby I love this yarn. If you could help with a Colorado number I'd love you forever! My niece is going there in ths fall and I'd be interested to hear the answers. I was thinking a maroon or burgandy and white would work but am not sure. Well they're the " crimson tide" so crimson and white but getting the right crimson red might be tough. From the pictures of their tee shirts and things it's like a dried blood color ...gross but the best way I know to describe it! 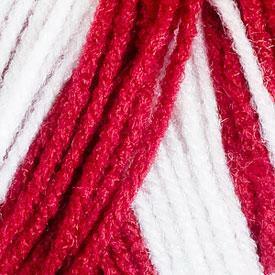 So I went online to hobby lobby and their I love this yarn and found a color called cranberry that looks good. Then went onto red heart and found one called ranch red. I had a page pulled up of Alabama gear and by switching back and forth I think these two are contenders. I'll wait see if we get any response to our posts! Here is a place on Amazon that has the crimson color in yarn. If you scroll down, you will see mor options. Hope this helps. Not sure if this is the exact red color, but Premier yarn has a Crimson, too. I discovered this company on the internet last year, can't remember how, and they are in NC. Their Big Ball is 16oz, and only $9.99. It's so soft, I love it. I've used it for several projects, that pound of yarn is handy! I have several colors, but not the crimson, so I can't say for sure how that "feels"... I like it so much more than other pound skeins, they seem so scratchy compared to this. You can call the website's 800 number, they are really helpful, even telling me what colors go together in their Ever Soft yarn in real life and what didn't match, for an afghan I was doing in shades of brown/green. Can't beat their price either, $1.99. I don't have anything to do with this company, just a happy customer! Welcome to Crochetville from South Carolina! All the SEC reds are so close yet so different. The Razorbacks have red, South Carolina garnet, and Alabama Crimson. It can get pretty tricky! 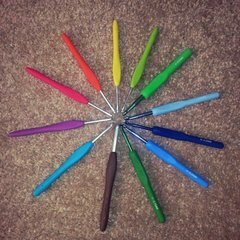 So glad you've joined - and good luck finding just the right color! from Western PA and I hope you find the right shade! Mattenylou thanks for the site! This looks like the perfect shade! And thanks all for the warm welcome everyone! Just went to your page and saw the Afghan! OMG! Its perfect! How did you do that? I'm not sure I'm that advanced! Great job on it! Red Heart now makes a yarn called Team Spirit that comes in a blend of two colors. I have a skein of the burgundy and white colorway. My daughter's a sophomore at UA. She's home for the weekend and sitting in the room with me. I pulled my skein out and asked her if it was close to UA colors. She looked at me like I was a little bit nuts and said, "It is UA colors." Photo used with permission of Red Heart Yarns. I belive it,s red and white . My nephew is starting there this fall and I'm thinking of making him something with UA colors for his graduation. I just started crocheting so don't know yet what I will make. Glad you asked this question! The original post is from 2013.